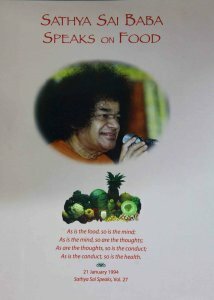 Sri Sathya Sai Baba descended from the Formless Absolute on November 23, 1926 to establish the modes of earning peace and to re-educate the human community in the paths of peace. This book contains the wisdom He imparted to His followers, giving them firm directions on how to live peaceful and healthy lives. It contains Bhagawan's directions in choosing the best foods for our physical and spiritual health. He has enlightened how the food taken through all the senses affect our minds, thoughts, conduct and health.